When it comes to lifting heavy objects, hoists are both extremely effective and versatile. So whether you’re looking for a temporary electric hoist in order to assist builders on site, or you’re looking to get a more permanent scaffold hoist that will help to speed up day-to-day processes. There is something out there for you. When it comes to actually operating a hoist, there are three main types of operation methods used throughout the industry. Below we have outlined the three most common types and how and where you would be likely to use them, however, your requirements might be unique, so you should always contact a professional who can discuss what you need. Never guess when it comes to choosing a hoist. Their operation, whether permanent or attached to a temporary scaffold can be dangerous if not handled correctly, so always seek expert, high quality advice. First, we have manual operation, also known as elbow grease! These hoists require the operator(s) to physically pull on the system, typically this is done by pulling on a chain or lever, where pulling one way will lift the object and the other will lower it. For heavier loads, it is also possible to get multi-operational manual hoists, where multiple operators are required. Manual hoists are mainly used when lifting/moving of objects is not constant. Hoists designed for occasional use where the height of lifts if often not that great are often manual and they can offer a cost saving over powered hoists. Additional factors such as how quickly and precisely the object needs to be moved are taken into account too. Whilst they do offer relatively high precision, the speed is limited to the operator of the hoist. This is why manual hoists are generally used when moving an object at a slower pace, or when there is minimal time-limiting factors. Furthermore, with the compact design used for these hoists, they are able to fit in much smaller spaces than the other operation types. They are also handy in locations where it is impractical/impossible to supply the hoist with the required power source, as manual hoists simply require labour. 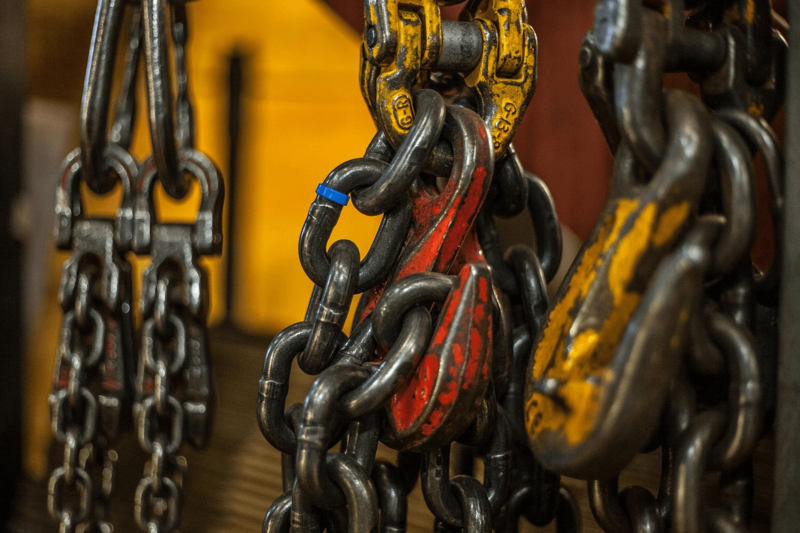 You need to also check whether chain slings and lifting equipment will necessitate a powered hoist over a manual one and whether it will work on your scaffold gantry if using one. Put simply, do you have the required manpower and is safety an issue? Next up we have the electric chain hoists. As the name suggests, these hoists are powered using electricity. This does mean that you need to hook the system up to an electrical output in order to use the hoist and you might need the help of a qualified electrician to perform this task. The way that electric hoists are operated is through the use of a control panel. This panel has a series of buttons or levers that allow you to operate the hoist. This allows the operator to hoist objects with high precision and speed. This also allows you to quickly move items when necessary. The only drawback to using electric hoists is their limited use time. As with many electrical appliances, excessive use can cause the appliance to overheat, and if done often, or for long periods of time, this can cause the appliance to break. So it is therefore important that you strictly follow the guidelines provided to you when purchasing an electric hoist. CLM has a wide range of electric hoists, and can offer the perfect scaffold hoist to suit your ideal requirements. Last but certainly not least is the pneumatic hoists, also known as air hoists. These hoists use air pressure as the source of their power. It is important to note that an air hoist will only operate as good as the air provided, so prioritising this is crucial. One of the great things about air hoists is that they can be used 24/7. The reason for this is because the hoist is operated on air, the air cools the hoist when operating. This also means that it is great for lifting heavy objects as, without the risk of overheating, you can safely lift as much as you need. For those reasons, you typically find air hoists within the industrial business, as it can constantly provide the results you need. Not every hoist will suit every situation, hence the wide range available. The one you choose will depend entirely on lifting loads, lifting speed and lifting capacity requirements, so due diligence is required to ensure you get it right and ensure a safe operating environment for your staff. You should also check the requirements for spare parts and ensure your supplier is able to support you during the sale, operation and future servicing of your hoist. ← New Year – New Products From CLM!